The 1988–89 NBA season was the 43rd season of the National Basketball Association. The season ended with the Detroit Pistons winning the NBA Championship, sweeping the Los Angeles Lakers. This was the first season of the Miami Heat and Charlotte Hornets. Los Angeles Lakers facing the Boston Celtics in Dec. 1988. This would be Kareem Abdul-Jabbar's last jump ball at Boston Garden. The NBA adopts the three-official system used in college basketball permanently. The league experimented with three officials per game in 1978–79, but went back to two officials per game for the next nine seasons, although they actually have three with the inclusion of an alternate referee for all playoff games and selected regular season games. The Miami Heat and the Charlotte Hornets become the league's 24th and 25th franchises. The Heat plays its inaugural season in the Midwest Division. As a result, the Sacramento Kings move to the Pacific Division. The 1989 NBA All-Star Game was played at the Astrodome in Houston, Texas, with the West defeating the East 143–134. Karl Malone of the Utah Jazz takes home the game's MVP award. New Arenas: The Milwaukee Bucks move from the MECCA Arena to the then-Bradley Center (naming rights currently with BMO Harris Bank as of 2012), the Sacramento Kings move from ARCO Arena I to the then-ARCO Arena (later Power Balance Pavilion, now Sleep Train Arena), and the Detroit Pistons move from the Pontiac Silverdome to The Palace of Auburn Hills. Michael Jordan records ten triple-doubles in eleven games near the end of the season. Prior to the season, the first-year Hornets announce that they choose teal as their primary color, which gave them immediate attention. In the next decade, expansion teams in the other professional sports leagues (most notably the San Jose Sharks of the NHL, the Florida Marlins of Major League Baseball's NL, and the Jacksonville Jaguars of the NFL) further popularized the use of the color. The Hornets also popularized the use of pinstripes on the uniforms, which were later adopted by the Orlando Magic, Chicago Bulls (alternates only), Toronto Raptors, Indiana Pacers and the current Charlotte Hornets' predecessor franchise, the Bobcats. The Chicago Bulls started a playoff tradition by wearing black sneakers. Prior to that, the Boston Celtics were the only team to wear black sneakers. Following the Bulls' unlikely playoff run, other teams began adopting the style, beginning with the Philadelphia 76ers in 1990. This was Kareem Abdul-Jabbar's last season. The Los Angeles Lakers became the first team to sweep two consecutive best-of-seven series. The Celtics, who had won no fewer than 57 games over the previous 9 seasons, slump to 42 as Larry Bird played only six games due to injuries. The Indiana Pacers had 4 different head coaches during the season, a rare occurrence that has not happened since. Seattle SuperSonics guard Dale Ellis won the All-Star game's 3-point shootout. The first cancellation of an NBA game due to a civil disturbance. In the wake of the Miami riots, the game between the Miami Heat and the Phoenix Suns on January 17, 1989, was canceled. Jerry Sloan begins the first season of 23 for the Utah Jazz, the longest tenure for any professional coach for one city and franchise. A ticket for a November 1988 game between the Dallas Mavericks and the season's eventual champions Detroit Pistons. A ticket for a game between the Miami Heat and the Charlotte Hornets during their inaugural season. The League expands from twenty-three to twenty-five franchises, with new expansion teams in Charlotte and Miami. The Heat began its season as a member of the Western Conference despite its geographical position, enduring its longest road trips when playing Western Conference teams. It also began the season 0–17, at the time the worst start in NBA history. The Hornets finished at 20–62. Such records are typical of expansion NBA franchises in their initial seasons, with 15–67 being the poorest record repeated by the Cavaliers, Grizzlies, Rockets, and Mavericks, as well as the Heat. The Sacramento Kings were belatedly moved to the Pacific Division in their fourth season after leaving Kansas City. A ticket for Game 1 of the 1989 Eastern Conference Semifinals between the New York Knicks and the Chicago Bulls. 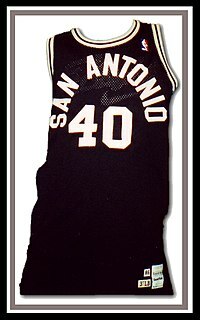 Willie Anderson, whose game worn 1988–89 away uniform is pictured, was selected to the All-NBA Rookie Team.